The BBC's weekly The Boss series profiles a different business leader from around the world. This week we speak to Stan Boland, founder and chief executive of UK driverless car company Five AI. Since then it has been moving as quickly as possible to design a driverless car that - the hope is - will at some point in the future gain regulatory approval to take to the roads without someone being behind the wheel as a human failsafe. The problem is that, compared with US giants Google, Uber and Tesla, Five AI is a tiny start-up company with only a fraction of the funding that its rivals' driverless car projects are receiving. And when it comes to number of employees, Google's autonomous vehicle business Waymo is estimated to have some 3,500, and Uber's self-driving arm is said to have about 2,000. While both of these declined to share exact staff numbers, Five AI's workforce currently totals just 120 people. 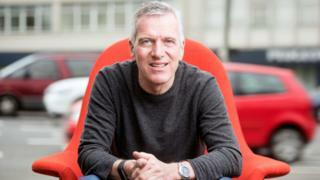 Mr Boland freely admits that his project is "a gamble", and that "a number of bets have got to come off for it to work", but there is no doubting his ambition. "We are building a company that I actually think will be worth tens of billions, if not more, but it is going to take a lot of focused effort to get there," he says. At this point many people may scoff, but with Five AI technicians now testing its adapted Ford Mondeos on the streets of south London, Mr Boland's back story suggests he should be taken seriously. While he admits that Five AI is going to need more investment to fully develop its vehicles, he says it can do it more cheaply than its rivals, because it doesn't need to employ the vast number of supplementary staff that they do. "There is always a team of 20 to 50 people [at any driverless car company] that is really driving the technology," he says. "That is what it comes down to. "So while Google's Waymo has [an estimated] 3,500 people, and Uber a couple of thousand, it really all comes down to just a handful of individuals. "And the talent in computer vision and machine learning here in Europe is as strong as in the US." Based across six offices in the UK - London, Bristol, Cambridge, Edinburgh, Oxford and at a testing track in Bedfordshire - Five AI also works closely with computer vision and artificial intelligence teams at the UK's top universities, and the Alan Turing Institute, the UK's leading AI research centre. Mr Boland says that he wants all of his staff to "feel ownership of the company", so all are given shares in the business. Back when he sold Element 14 it meant that most staff became millionaires overnight. "The least anyone made from the sale was a part-time secretary, and she received £250,000." "It is a massive ask from where we are today, but I do think that in the next three or four years we are going to get to a level where the cars are equal to human levels of safety," says Mr Boland. "And then we want to improve from there." UK motoring journalist Robin Roberts isn't sure. "I think that most people would not feel that confident," he says. "Humans are able to react very quickly to their surroundings, and unforeseen events that happen on the roads. I don't think that a programmed computer could ever do the same as safely. "There is no substitute for human reason in situations where split-second decisions have to be made." However, Mr Boland is confident. "We are going to transform the way our cities operate. It is going to be a massive revolution."